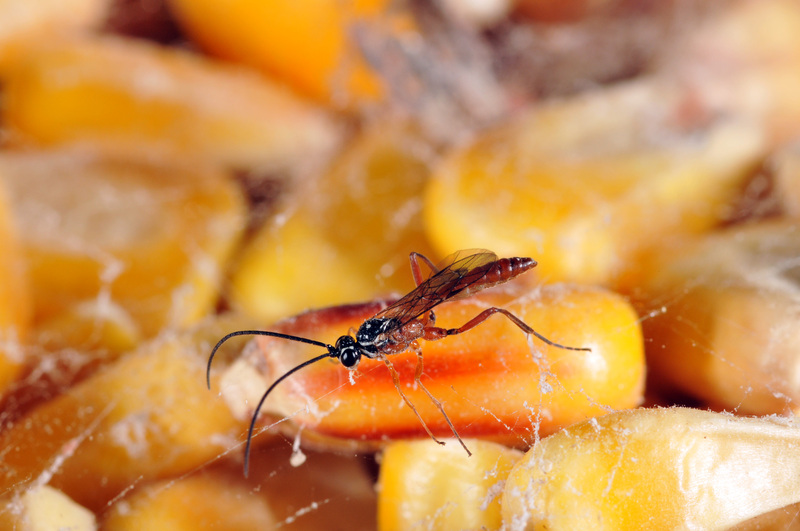 Anisopteromalus calandrae wasps are beneficial insects commonly found in grain/food storages. They are an important natural enemy of Sitophilus weevils. 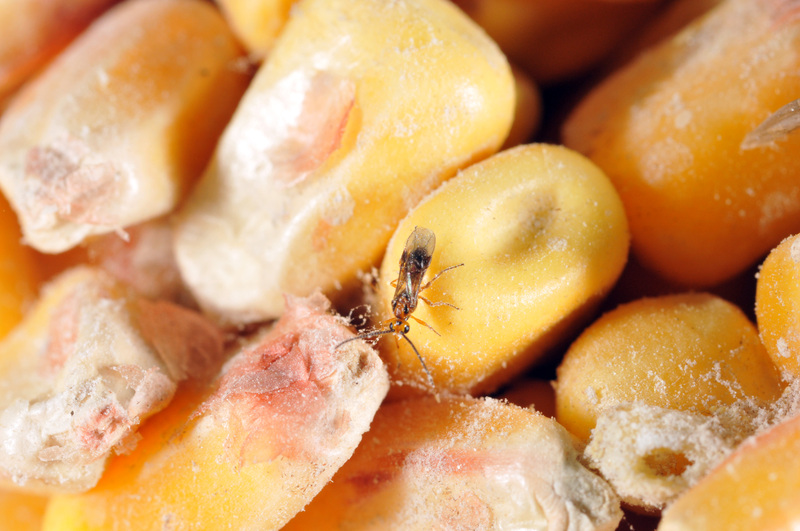 Due to its value as a biological control agent this small pteromalid wasp is now produced commercially for mass release in grain bins. An advantage of this wasp species is that it can withstand higher dosages of pesticide than its host. This would be beneficial in storage systems using residual pesticides. Weevils generally live inside whole grain kernels. A. calandrae feed on weevils by boring its stinger like drill through the kernels and depositing an egg on a immature weevil. The young wasp larvae then eats the weevil larva. How wasps track down and find the hidden weevils remains unclear. They may find the pests by tapping their antennae on the kernels and feeling vibrations, by “smelling” the weevils, or by hearing the weevils chewing. It takes a wasp about 12 days to go from egg to adult at 30˚C. Adults are long-lived, with adult female longevity lasting approximately 70 days. During their lifetime, females can oviposit approximately 280 eggs. A. calandrae prefers weevil larvae (Sitophilus spp.) however it can also attack larvae external to grain, such as cigarette beetles. Habrobracon hebetor is also commonly found in grain/food storages. It is a small black, wasp with a reddish head and a reddish thorax. Cosmopolitan in distribution, they are a very effective parasite in grain storage systems as well as certain field crops. Females paralyze and lay eggs in late instar moth larvae. Each female can produce about 100 eggs. On the average, eight larvae develop in one host larvae. The larvae feed externally on the host and eventually pupate within white cocoons. It takes about 10 days to go from egg to adult at 30˚C. In temperate regions, adults hibernate throughout the winter, resulting in up to 6 generations per year. Adult female longevity is about 23 days. Since its development time from egg to adult is about 1/2 that of it’s host, and several adult wasps can be produced from one parasitized host, this species is considered an excellent biological control agent for moth pests. A related species, Venturia canescens, has only one larva completing development in each host; supernumerary eggs and other wasp larvae are consumed by the first larvae to emerge. H. hebetor is a parasite of the common grain moths, Indianmeal moth, for example, during the last larval stage. Other hosts include Mediterranean flour moth and almond moth.